To keep your lawn looking great we mow at a different angle each week, this prevents a matted look, or lines formed from mowing in the same direction. After mowing and trimming all clippings are collected, and for a neat apearance we blow clippings off walkways and driveways. 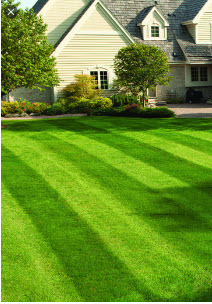 As part of your lawn maintenence packege, we edge the driveway, patio, walkways, and beds that adjoin the lawn. You will be happy having our professional staff working in your yard.